Mickey’s Drew Aloisi (right) discusses the benefits of the new Lay’s van body. APRIL 2018 – PepsiCo fleet supervisors, managers and field personnel who attended the soft drink and snack food giant’s Technical Training Summit last month in Arlington, TX took time out from their class schedules to visit with all the vendors who support the Pepsi and Frito-Lay brands. 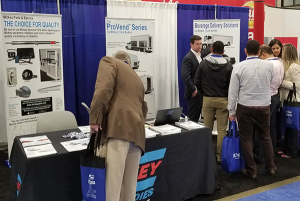 Mickey Truck Bodies was one of the more popular stops on the Arlington Convention Hall exhibit floor. 2. The Mickey booth drew a steady flow of PepsiCo fleet managers during the Technical Training Summit in Texas. Lay’s is one of the marquee brands of PepsiCo’s Frito-Lay division. 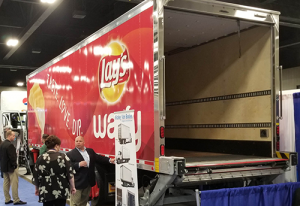 In addition to the Lay’s Potato Chip truck (pictured), Mickey is also producing bodies for the Tostitos, Lay’s Wavy, Doritos and Ruffles brands. “Mickey Truck Bodies is excited to be building these 30-foot bodies to carry all of the prestigious Frito-Lay brands,” says Tom. Mickey has been building bodies and trailers for PepsiCo and its bottlers around the world for more than 50 years.